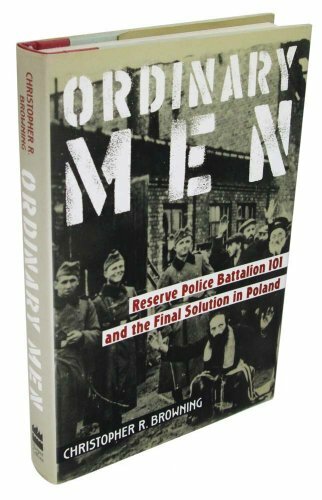 In the early hours of July 13, 1942, the men of Reserve Police Battalion 101, a unit of the German Order Police, entered the Polish Village of Jozefow. They had arrived in Poland less than three weeks before, most of them recently drafted family men too old for combat service--workers, artisans, salesmen, and clerks. By nightfall, they had rounded up Jozefow's 1,800 Jews, selected several hundred men as "work Jews," and shot the rest--that is, some 1,500 women, children, and old people. Most of these overage, rear-echelon reserve policemen had grown to maturity in the port city of Hamburg in pre-Hitler Germany and were neither committed Nazis nor racial fanatics. Nevertheless, in the sixteen months from the Jozefow massacre to the brutal Erntefest ("harvest festival") slaughter of November 1943, these average men participated in the direct shooting deaths of at least 38,000 Jews and the deportation to Treblinka's gas chambers of 45,000 more--a total body count of 83,000 for a unit of less than 500 men. Drawing on postwar interrogations of 210 former members of the battalion, Christopher Browning lets them speak for themselves about their contribution to the Final Solution--what they did, what they thought, how they rationalized their behavior (one man would shoot only infants and children, to "release" them from their misery). In a sobering conclusion, Browning suggests that these good Germans were acting less out of deference to authority or fear of punishment than from motives as insidious as they are common: careerism and peer pressure. With its unflinching reconstruction of the battalion's murderous record and its painstaking attention to the social background and actions of individual men, this unique account offers some of the most powerful and disturbing evidence to date of the ordinary human capacity for extraordinary inhumanity.